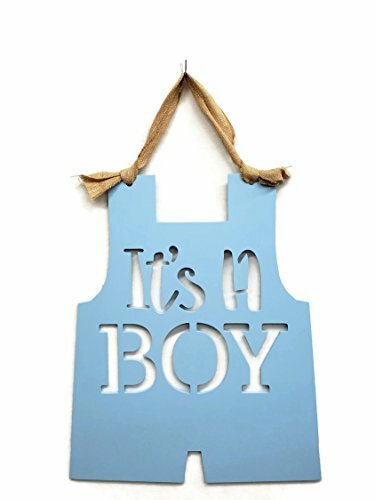 This 23" hand painted It's a Boy blue overall makes for a great hospital door piece, baby gift or for a baby shower! This piece is cut from MDF which makes it very light for hanging. All products are manufactured in the USA with quality composite & wood material. Wood is full of inherent character, blemishes, holes, small cracks, and knots that are not considered defects but unique elements that give each piece character. No two pieces are ever exactly alike. Pieces may not be returned for any of the reasons listed above. The burlap ribbon finishes the piece to give it that shabby chic feel and makes it ready to be hung anywhere you choose! This piece is cut from MDF which makes it very light for hanging. If you have any questions about this product by Michelle's aDOORable Creations, contact us by completing and submitting the form below. If you are looking for a specif part number, please include it with your message.